Violence in the Middle East. Upheavals in Europe. Anxieties about American decline. Economic fears. A recent recession. Police brutality caught on video. Interracial conflict. Attacks on the police. A Clinton presidential campaign. The year was 1992, although it could just as easily be 2016. On the first night of the Republican National Convention in Houston 24 years ago, primary challenger Pat Buchanan took the stage to deliver his famous “Culture War” speech in which he argued that he and his supporters, the “Buchanan Brigades,” were fighting a religious and cultural war “for the soul of America.” He conceded to his bitter rival, President George H.W. Bush. Although the historical details might be different now than those more than two decades ago—the Persian Gulf War had just ended; Europe reeled from the Bosnian War; the trade war was with Japan; the Cold War ended; Black motorist Rodney King was physically beaten by four White and Latino police officers, the act of which was caught on a home video camera, and Los Angeles burst into flames after their acquittal and mistrial—the anger and frustration of the Buchanan Brigades was a palpable and surprisingly large minority of Republican primary voters. This minority has grown in influence, from substantial fringe to king-making majority. In the 2016 election cycle, the bulk of Republican voters channeled that particular anger and frustration into the GOP presidential nomination of Donald J. Trump—not just a surprising primary challenge of a sitting president as in Buchanan’s case in 1992. One liberal pundit has characterized Trump’s supporters as deploying vengeance and revanchism. Although revanche is French for "revenge," revanchism has the historical connotation of reclaiming lost territory that is felt to be rightfully one’s own nation’s, specifically the Alsace-Lorraine province of France that was lost to Prussia in 1870. 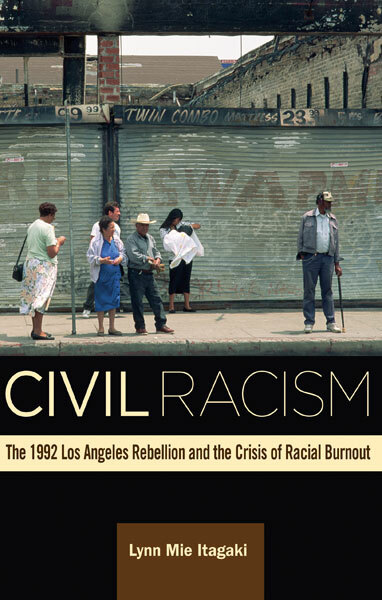 Geographer Neil Smith has connected revanchism to the decades-long gentrification policies that justified the removal of poor people (of color) from cities (see: Neil Smith). As the antagonists were then in 1992, so they are in 2016: America has been overrun with and must be "taken back" from terrorists, from criminals, from immigrants, from protestors. Often referred to as backlash politics, much of this anger has been attributed to the perception that America has lost (or will lose) its unequivocal global dominance, no longer the undisputed winner of the Cold War as the lone, unassailable global superpower. The 1990s were riven by such concerns as “balkanization” and interethnic strife that had shaken and toppled governments around the world in the post-Cold War era. The criminal justice system leads to order, which leads to justice, which grounds civilization. To disrespect police officers, as an element of the justice system, thus destabilizes civilization. The problem with Zakaria’s point about civilization is that he creates a false dichotomy, an implicit us versus them: those who respect officers of the law and support civilization, and those who don’t respect officers of the law and support instead some putative “law of the jungle.” However, if justice is the bulwark of civilization, and the merits or strengths of a civilization is judged by the justice it dispenses, then where there is little justice, there is little civilization even with respect for officers of the law. What if instead we were to understand the protestors’ chants of “No Justice, No Peace” as a description of the experiences of entire communities, numbers that continue to grow beyond the loved ones that Castile and Sterling left behind? The “not-so-veiled threat” that Zakaria identifies is the protesters’ bringing these injustices and rights violations to the broader U.S. public and forcing these wider audiences with little firsthand experiences to include these injustices as part of the America to which they belong. The more accurate dichotomy, then, is between those who feel they have had justice and peace that can be disrupted by the protesters and those who feel they have never had justice or peace in the first place. In other words, if we feel that our experiences have largely been about justice and peace, then we have been lucky enough to have lived in a world that has been relatively protected from the daily lived experiences of the protesters and the victims of police brutality. The question remains whether we will respect and recognize these experiences as part of the everyday America we live in and the history we claim as our own. This division indicates the “two societies” toward which we have moved, not “one white, one black” as the original 1968 Kerner Commission Report read, published after years of urban unrest had sparked across the nation, taking lives and burning out neighborhoods. Instead, our nation today is divided between those who believe the U.S. system of justice is fair and those who do not. These divisions force us to answer hard questions about whether our society and civilization will be marked by the inclusiveness and understanding that so many politicians, policymakers, and pundits insist American society to be. Will our concept of America include and understand these experiences of injustice and unwarranted state violence so that we will protest the killing of one of our own, whether civilian or police? Now, with consequences far greater than this presidential election, we get to choose: which America will we take back, the one of division or inclusion? 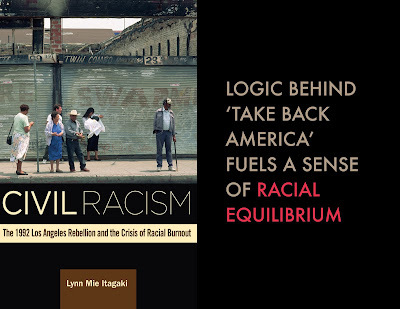 Lynn Mie Itagaki is author of Civil Racism: The 1992 Los Angeles Rebellion and the Crisis of Racial Burnout. She is associate professor in the departments of English and women's, gender, and sexuality studies and the Program Coordinator in Asian American Studies at The Ohio State University. "Lynn Mie Itagaki’s book is an incisive critique of the civil racism that has become dominant in both liberal and conservative discourses of race in the post-Civil Rights era."